Labyrinth Lord, written by Dan Proctor of Goblinoid Games, is, as everyone who reads this blog undoubtedly knows, one of the primary retro-clone games currently available. It's explicitly modeled after the 1981 Dungeons & Dragons Basic and Expert rules written by Tom Moldvay, David Cook, and Steve Marsh. Like all retro-clones, LL necessarily introduces some mechanical wrinkles that cause it to deviate from the original game rules but (it is hoped) in so slight a fashion as to be unnoticeable in play. On this score, I feel that LL succeeds admirably; it really is a terrific approximation of the Moldvay/Cook rules and, given that its entire text is both completely open and available free to download, the game offers a tremendous opportunity to keep the spirit of "Red Box fantasy" alive and well with new products. The release of Original Edition Characters, though, suggests that Proctor has something even more ambitious in mind for Labyrinth Lord. 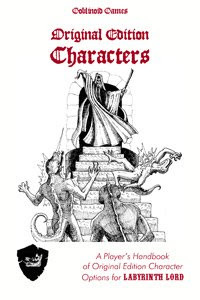 Available either as a PDF or a printed book, this 66-page product is self-described as "a player's handbook of Original Edition character options." Of course, by "Original Edition," Proctor means OD&D, as should be apparent from the excellent cover art by Steve Zieser, which recalls the box art from the fourth and later printings of that game. Original Edition Characters is thus an "emulator" for LL, one that enables you to play in a style more closely approximating OD&D than the default Moldvay/Cook vibe of this retro-clone. In practical terms, this primarily means changes to the way character classes work (including the elimination of the Thief and the demihuman classes), as well as the way ability scores function. The changes to LL are instituted elegantly and while they don't always reflect absolute fidelity to OD&D -- Fighting Men, for example, get 1D8 hit points per level rather than the variable number of D6s + bonuses of the little brown books -- the end result is something that, on a functional level, feels very much like OD&D, albeit one with a bit more clarity of presentation. That's probably a good thing, since Original Edition Characters is intended as a "player's handbook." That is, it's geared toward being a handy reference for players as they create their characters. Referees will find it essential as well, but the product is written in a way to give players everything they need to play. I think this is an amazing thing, given both the brevity of the product -- the bulk of its 66 pages is taken up with spell descriptions -- and its low cost. I've long been of the opinion that what the hobby needs is a simple, inexpensive intro game that isn't a "crippleware" product that's an elaborate advertisement for a more complex, expensive game that's the "real thing." Original Edition Characters is a good example of the kind of thing I'd like to see more of. If this product has a flaw, it's that it cleaves a little too closely to the baseline Labyrinth Lord rules, particularly when it comes to spells and their effects. It's true that the list of spells in Original Edition Characters is closer to that of the three little brown books (plus supplements -- magic missile is included, for example), but the descriptions of these spells, so far as I could see, are not at all different from those in Labyrinth Lord. Now, on one level, this is a good thing, both because it helps unify the LL "brand" and because it avoids confusing players and referees already familiar with the baseline LL rules who might simply assume spells work identically. The problem is that, at least according to some interpretations of OD&D, part of its appeal is attempting to make sense of its often-unclear spell effects. OD&D is a text that demands its reader engage it, because it's well nigh unplayable with such engagement. Original Edition Characters makes fewer such demands than say Swords & Wizardry, owing to its retention of LL's clarity, but then I suspect that's part of the point. Despite this possible criticism, I think one of the most important things about Original Edition Characters is that it reminds us that, whether your favored version of the game is OD&D, OD&D + Supplements, Holmes, AD&D, Moldvay/Cook, or even Mentzer, these games all have far more in common with one another than they do with their wayward descendants. It's something I need to be reminded of from time to time myself, so I'm grateful to Dan Proctor for having done so. What he's done here is show that, with a few mechanical tweaks and the right frame of mind, you can easily switch between modes of play to reflect one of several distinct "eras" of old school play. Given that the foreword makes reference to an upcoming LL product called Advanced Edition Characters, we'll eventually see how far this approach can be taken and just what it will mean for the old school revival. Downloadad! I'll be interested in giving this a spin. Looks cool so far. "Now, on one level, this is a good thing, both because it helps unify the LL "brand" and because it avoids confusing players and referees already familiar with the baseline LL rules who might simply assume spells work identically. The problem is that, at least according to some interpretations of OD&D, part of its appeal is attempting to make sense of its often-unclear spell effects. OD&D is a text that demands its reader engage it, because it's well nigh unplayable with such engagement." I've got nothing against LL or OD&D or even this supplement, but this section of your post just strikes me as odd. I don't want my RPG rulebook to be like the Bible, where I have to study it and delve into it and learn to study the letter as well as the spirit of the rules and be taught how to know when to apply one or the other as needed. I want clean, clear, well-written rules that have a balance of professionalism and approachability, are well-edited and proofed, and don't require 30+ years of meditation to finally "get". I'm not necessarily saying OD&D is like this for everyone, or even me, I'm just saying the whole "it's not a bug, it's a feature!" approach to RPG documents doesn't have much appeal to me. Beyond that though, nice review - sounds like a cool product. I disagree wholeheartedly on this point. I think that, in a game of the imagination, clear, well written rules just aren't interesting. By trying to eliminate all the vagaries of various rules, what you're doing is implying that there can be just one "right" way for each thing to work in game. I think that's wrong, and a rules text with room for interpretation is one with room for creativity. Just as a frex - OD&D has a saving throw for "Death Ray." What does that mean? Is it a save vs. Finger of Death and similar spells? Are these dungeons littered with death rays, and if so are they science or magic? "I disagree wholeheartedly on this point. I think that, in a game of the imagination, clear, well written rules just aren't interesting. By trying to eliminate all the vagaries of various rules, what you're doing is implying that there can be just one "right" way for each thing to work in game. I think that's wrong, and a rules text with room for interpretation is one with room for creativity." Actually, I'll turn right around and say I think that approach is wrong. I want clean, clear rules because I want an unambiguous blueprint from which I can create whatever I want. I am more than capable of re-building whatever rules changes I want - but I want to do it on my own terms, not because I can't honestly figure out exactly what the rules designer was trying to intend in the first place. I will followup my comment with the obligatory "but whatever floats your boat". I like my rules nicely laid out so I can see what I'm working with before I tear them apart. You like a lot of "wiggle room". Either way, I think we can both manage to get in plenty of fun gaming on our own terms. I am more than capable of re-building whatever rules changes I want - but I want to do it on my own terms, not because I can't honestly figure out exactly what the rules designer was trying to intend in the first place. I don't doubt that you are creative enough to do so. But gaming culture is what it is, and as I've found it there is a greater tendency to leave rules that are clearly designed and elaborated in place, both from a DM angle and a player angle. There is a certain degree to which people tend to the path of least resistance, and for DMs that means hewing to the rules as written. For players, there is a tendency to assume that the rules are somehow "right," and I believe it's one that increases with the clarity of rules. It's why I think running OD&D is a liberating experience for so many DMs - you can't just rely on "rules as written" because they don't cover all situations, and you have to make a ruling and flex your DMing muscles. Will download once I get home. I'm impressed. Dan not only puts out quality product, he successfully re-imagines, creates, and pays homage all at once, and obviously has a vision. -Such a good time for the hobby. I find there are (at least) two kinds of rules that might be called unclear. The first are those that "don't cover every situation." I love rules like that. I love spell effects that read "causes the next missile attack to unerringly strike its target" and leaves it "unclear" whether spitting off a bridge at a guard is a missile attack, or whether it allows you to hit targets you cannot see or that your missile could not otherwise reach. The other type of unclear rule is the rule that leaves it unclear why the rule was written in the first place, or what effect it was meant to have at all. This is a rule that is unclear in all situations. I do not cherish the opportunity to apply the rules of statutory construction to my rules. I want my rules to say exactly what was contemplated, and let me figure out how to apply them when an unanticipated situation arises. Death ray falls into this category for me. I have simply no idea what is meant by "death ray." I can't figure out if a radiation beam is like a death ray because I don't know what a death ray is. When I find myself saying, "well, we already have a save for wands and for spells, so death rays must be something else," that's when it stops being fun for me. Why does the fun stop then? Because everyone at the table can apply the rules of statutory construction. If the DM applies them incorrectly, or misses a critical rule in a separate book that makes it clear that the author of the statute knew how to specify a "mechanical death beam" if that was their intent, so obviously "death ray" doesn't mean "mechanical death beam," all of a sudden we're playing the "argue over the original intent of the authors" game, not the "imagine what might happen" game. I simply don't find the former game any fun. Thanks for the kind review of OEC! This was my first paying illustration job and I'm very happy with how it came out! Good review James, thank you! I've downloaded the file and I'm going off to play in my sandbox now. My one claim to infamy in the grognardosphere is having been (ASFAIK) the first frothing foe of a nascent OSRIC. Now, I look forward to the day the Mutant Future hardbound is front and center at the FLGS! Maybe it's just coincidence, but WOTC has sussed to the market for crappy PDFs of the classics. So, it'll cost you something like $5 to glom the original little brown booklets. Despite this possible criticism, I think one of the most important things about Original Edition Characters is that it reminds us that, whether your favored version of the game is OD&D, OD&D + Supplements, Holmes, AD&D, Moldvay/Cook, or even Mentzer, these games all have far more in common with one another than they do with their wayward descendants. I would have to agree, and it's certainly a great source of enjoyment for eclectic sorts like myself who happily poach from almost every edition in order to get the game that they want. On the subject of clarity vs. having to winkle one's own interpretation out of a fuzzy ruleset; I find I prefer a middle-of-the-road sort of flexibility myself. But different strokes for different folks, right? I have to agree though, this is a lovely supplement. I need to go fetch a copy now. So, are you saying this is a bad thing? I was rather pleased to see the books are available at all. A 1st ED Deities and Demigods is going for $30 at my local game shop because it's been out of print so long. I think a $5 PDF is well worth the price for just about any of these books. No, it's a good thing. If you don't want one of the competing disambiguations/revisions, it doesn't cost much to get the classic text. Anyway, this sounds like what I thought should’ve been done with OSRIC. Use OSRIC as a base to create variants closer to the various other editions. All under a derived-from-OSRIC banner. I think what we're seeing is lots of people all coming at the same thing through different means and processes, but I don't think that's a bad thing. Back in the day, multiple versions of D&D existed side by side, with each referee picking and choosing those bits he liked the most. We're right back at that situation and I couldn't be happier. Yeah. That is generally my attitude as well. People work on whatever project they want to and that’s as it should be. We’re all able to draw from these different resources and synthesize something that works for us. Indeed that is a positive thing about our hobby.